It was a sombre weekend as championship leader Didier Pironi’s F1 career was ended following a nasty crash in qualifying. The race was emotionally won by Ferrari’s Patrick Tambay, but the most memorable moment came when leader Nelson Piquet came up to lap the ATS of Eliseo Salazar. For whatever reason, Salazar didn’t give way easily and crashed into the Brabham driver, taking both out. A furious Piquet unleashed his kickboxing skills on poor Salazar, whilst the marshals stubbornly tried to prove that you can tow a broken F1 car sideways. After the 2001 British Grand Prix, Heinz-Harald Frentzen was sacked by Jordan following some disagreements about how the team should be run. He was replaced by Ricardo Zonta in Germany, but during the summer break (on 8 August, believe it or not!) it was announced that Jean Alesi would swap from Prost to Jordan for the rest of the season, whilst Frentzen took over Alesi’s seat at Prost. Some bloke called Nigel Mansell was born on this day in 1953. He won some races, had a moustache and once gave Ayrton Senna a lift back to the pits. 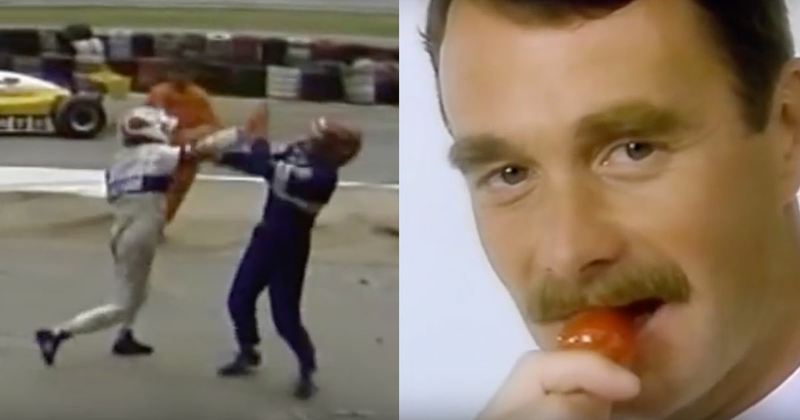 He also won the 1992 F1 championship and 1993 IndyCar title but was probably most famous for stealing a printer and then eating a strawberry. Another driver born on this day was Ricardo Londoño-Bridge. Yes, that was (apparently) his real name. The Colombian (who reportedly had links to drug lord Pablo Escobar) cropped up out of nowhere at the 1981 Brazilian Grand Prix as a pay-driver for the Ensign team and although he was pretty quick during a test session, officials refused to grant him a super licence. Marc Surer took over the car for the rest of the weekend and finished fourth, whilst Londoño-Bridge disappeared from the F1 scene as quickly as he’d entered it.